We are now in the heart of show season as February has snuck up on us. One important and often over looked aspect during show season is animal health. As someone who is involved in showing livestock, you obviously have a passion for caring for your animal. Sometimes that desire to keep your animals in the best possible health can get you in trouble with show residue rules. You as an exhibitor are responsible for knowing what the withdrawal of any and all medications that has been given to treat your sick animal. Withdrawal periods however can differ greatly from the “elimination period” of a drug. For instance the withdrawal period for an antibiotic might only be four days; the elimination period could however be substantially longer. Elimination period is the time in which no residue of the drug given or fed is left in the body. Many shows have a zero tolerance policy where drug residue is concerned. An exhibitor can follow the label exactly and still have trace elements of the drug used to treat present at the time of a urine analysis. This makes it extremely difficult to know how and when to treat sick animals. Even medicine given under vet supervision can still result in disqualification from the show if it is present in the urine. Please be aware of any and all “drugs” that may enter your show project. Keep in mind that not all drugs are administered via a shot, but a large number of your feeds are medicated. Know the medications that are in the feeds. It is my hope that the stock show will evaluate their policies where antibiotic residue is concerned. In a perfect world they would allow there residue policy to mirror the one of the FDA regulations. 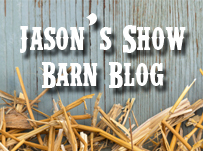 This entry was posted on Tuesday, February 3rd, 2015 at 1:47 pm	and is filed under Jasons Show Barn. You can follow any responses to this entry through the RSS 2.0 feed. Both comments and pings are currently closed.